Coordinates 40 ° 21’33 N, 14 ° 58’95E. Approach: to enter the port of Agropoli direct to Punta Fortino to starboard of the lighthouse from the unmistakable Venetian architecture, complete with a white blackbirds. Upon entering, keep to starboard. The access time is continuous. 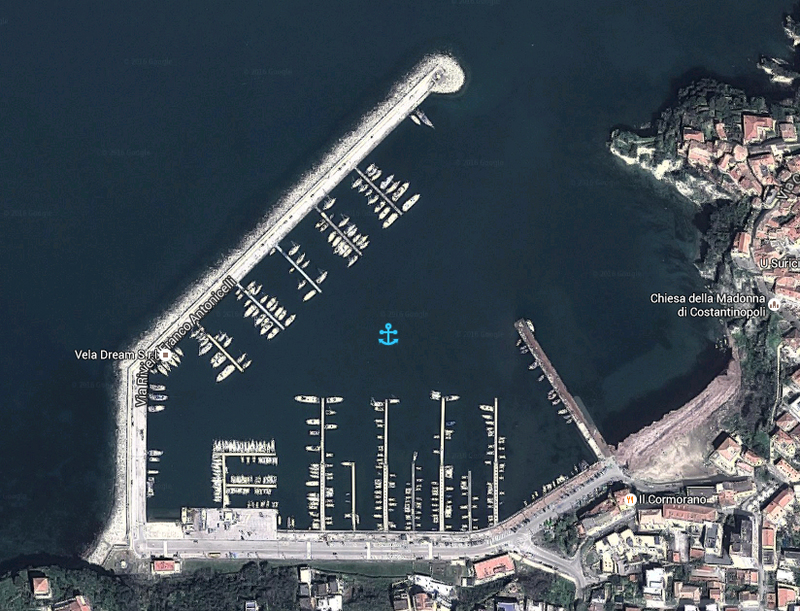 The port is a natural inlet protected by an outer breakwater at the root of which lies the shore quay and a pier. The seabed is sand and rocks from 1 to 5 meters. Light and lighthouses: lighthouse 2660 GPR2, white lambi periodic 6 sec., range 13 mg. Fortino NW tip of the city 2661 light flashes green, periodic 5 sec., range 5 mg. The head of the pier breakwater 2661-2 red light taillight fixed, brought 4mg., on the outer breakwater head. Line 1: Salerno – Cilento Coast, with connections to / from Salerno to Agropoli, San Marco, Acciaroli, Casal Velino, Pisciotta, Palinuro Camerota; active line on Saturday and Sunday. 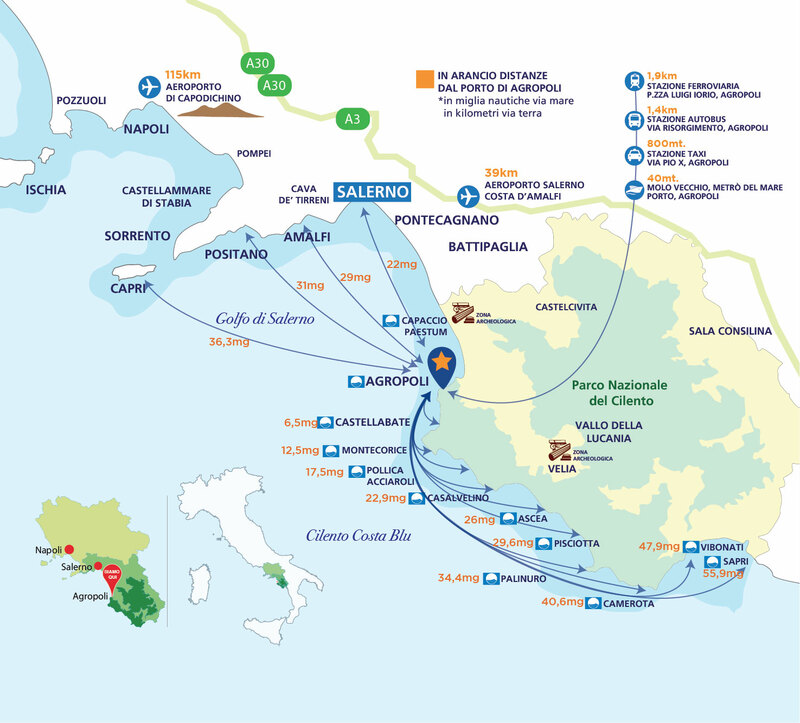 Line 2: Cilento-Amalfi Coast, with connections to / from Salerno to Agropoli, San Marco, Amalfi, Positano, (connection to Capri); It operates from Monday to Friday online. 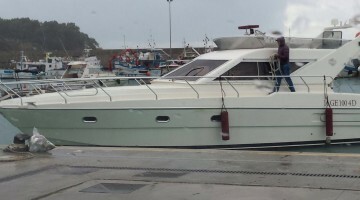 Line 3 / A: Cilento (Sapri- Capri – Naples) with cCollegamenti A / R from Sapri to Camerota, Pisciotta, Casal Velino, Capri and Naples; active on Tuesdays, Wednesdays and Thursdays line. Line 3 / B: Cilento (Sapri – Capri – Naples) with connections to / from Sapri Palinuro, Acciaroli, San Marco, Capri and Naples; Active on Monday and Friday.